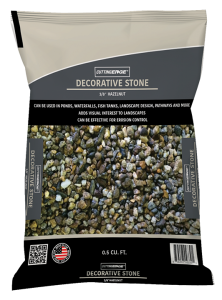 Cutting Edge® Hazelnut Decorative Stone is an attractive, rounded 3/8″ decorative stone that can add a beautiful visual interest to landscapes, known by its unique color. Our Hazelnut stone can be used for drainage, and can reduce weed growth, as well as enhancing ponds, waterfalls, fish tanks, landscape design, pathways, flower beds and pots. Our Hazelnut Decorative Stone can also be used as an effective erosion control product or to slow water flow from runoff. Can be perfect for homeowners and professionals alike, its color and beauty can stand the test of time and can require little to no maintenance. Our unique UV and water-resistant, non-slip packaging can provide extra protection for outdoor storage for use year after year.